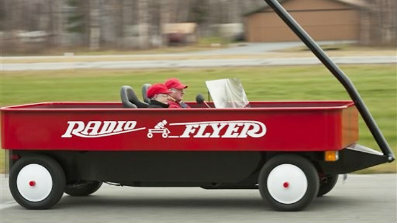 Fred Keller and Judy Foster live in Alaska, Wasilla to be exact, and they built themselves a wagon. It’s just like the ones they had when they were kids except they don’t need to ask anyone to pull them. Fred – 68, built it from a Mazda pick up truck, fiberglass, foam and marine plywood. He says it’s very sturdy and it’s street legal. As you can imagine, they get lots of smiles and honks as they drive down the road. No word yet when someone else will get a turn.